CDI new I-MAX can be purchased directly plug and turned on. Because in it there is already ignition curves (MAP), adjusted for daily motorcycle (standard). Special type of dual band filled MAP standards and road race. The 'Enter' to read the program that is in the CDI. Prior to setting the need to press 'Enter' first until it says 'Read'. Means programs that are in the CDI is being read. Wait a while until it says 'Ready' which means ready to apply the settings or designing the MAP. 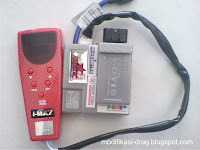 Especially on I-MAX dual band there are two programs, namely the ignition timing of the I-II and I-II limiter. You do this by connecting disconnect switch on the CDI I-MAP MAX dual band. MAP severity of such riders can do as you go along. This key is to make changes. Before you replace the ignition timing numbers or spin machine must press the 'Edit' first. After pressing the 'Edit' followed by increasing or decreasing the number of timing / rpm this by pressing the arrow keys.